Parker W. McClellan Jr., airport Executive Director said “Our partnership with DeTect offers the airport cutting edge technology that will enhance safety measures, and we are proud to say we’re the first to do it”. Northwest Florida Beaches International Airport (ECP) in partnership with DeTect, a local technology-based firm with several projects that enhance aviation security and safety, announced completion of the installation of a dual function MERLIN™ Aircraft Birdstrike Avoidance Radar and a DroneWatcher™ Drone Detection and Defense system called DroneWatcher DSR at ECP. 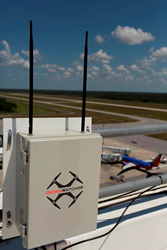 The DroneWatcher DSR provides a third layer of drone detection and defense for the airport. The DSR additionally functions as a bird radar providing real-time bird- aircraft strike risk alerts to airport flight safety managers. Drone incursion alerts and birdstrike risk alerts are provided to airport users via custom, real-time web displays and through automated text messaging. In April, the company installed DroneWatcherRF sensors and APP enabled devices at the airport as phase one of the project. The radar sensor installation completes the full system implementation to provide real time detection, tracking and automated alerting of both bird and drone strike risk to aircraft. Bird activity and drone situational data, incursion alerts and risk levels are delivered to airport users through custom, real-time web displays and by automated text messaging. With this installation, ECP is the first commercial airport in the world to install a dual bird-drone detection radar system. Today, MERLIN is the only bird radar being used operationally by air traffic controllers to issue real-time birdstrike risk alerts to pilots. With the add-on DroneWatcher module and RF sensors, the MERLIN system additionally detects, locates and interdicts drones and operators, allowing the technology to address the emerging threat to aircraft from drones operating near airports. Northwest Florida Beaches International Airport (ECP) offers some of the region’s lowest average airfares and is located less than 30 minutes from Panama City Beach, Panama City and the beaches of South Walton. Today, with service from Delta, Southwest, and United, ECP provides daily flights to worldwide destinations, including nonstop flights to Atlanta, Baltimore, Dallas, Houston, Nashville, St. Louis, Austin, and Chicago. The first international airport to be built in more than a decade, ECP provides Northwest Florida communities with first-class facilities and was strategically developed for major economic development opportunities. ECP is THE gateway to visitors seeking Northwest Florida’s famous beaches. DeTect is a US-based, global leader in remote sensing technologies with offices in the US and Europe and projects worldwide. DeTect’s products include drone surveillance and interdiction systems, aircraft bird strike avoidance radars, UAV Ground-based Sense and Avoid system, airspace and marine security radars, border protection radars, and bird radars for wind farm and industrial bird control and protection. Since 2003, DeTect has manufactured and delivered over 280 advanced systems worldwide.